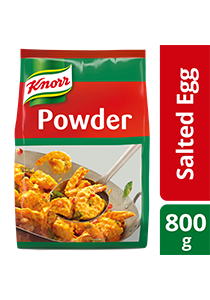 Learn how to use the Knorr Golden Salted Egg Powder to make your dishes in just 3 minutes! Chicken Egg, Maltodextrin, Shortening Powder (Contains Milk Protein), Yeast Extract, Creamer (Contains Milk Protein), Flavourings (Contains Egg), Colourings. Contains: Traces Of Cereals Containing Gluten, Soy, Fish, Crustacean, Mollusc, Peanut And Tree Nuts. Store in a cool and dry place. After opening, fold the bag and seal properly to keep balance of content fresh.